Traditionally, crown removal has been a difficult part of dentistry but this product makes things a lot easier. It also prevents damage to the tooth structure and is quite innovative in terms of design and how it works. 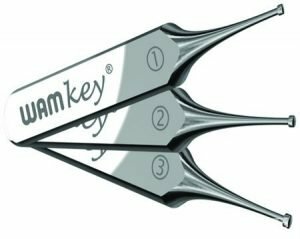 WAMKey is made of stainless steel with a small crank shaft on the tip of the tool and a handle on the other end. A small perforation is made in the crown and the tip of the tool is inserted into that hole. The crown is separated from the surface of the tooth using a gentle rotational motion. The only damage to the crown structure is the small hole where the WAMKey was inserted. It also causes very minimal damage to the tooth as it is operating in the cement layer of the crown. Other crown removal units use a tapping motion and then exert a lot of load and pressure on the tooth. This can lead to quite a bit of damage. WAMKey effectively debonds the crown with minimal force. It’s a very comfortable procedure for patients. Once the hole is drilled in the crown, all they feel is a gentle back-and-forth motion. This is a very well-designed unit and over the past five years I have used it frequently. I’m happy to recommend it to other dentists. This is a very simple tool that works very well. While it doesn’t have any negatives, the addition of a few extra tools could certainly improve the procedure. A very fine chisel would aid in separating the crown from the tooth at the margin. An indicator used in conjunction with an X-ray could identify where the crown ends and the tooth begins. The access hole could then be drilled at exactly the right height.